We decided after breakfast that today would be a good day for a day trip with Cody and Qianna. Since we’ve been here, we’ve wanted to go to Dahlonega which is south of the Chattahoochee National Forest. The map below shows our route. 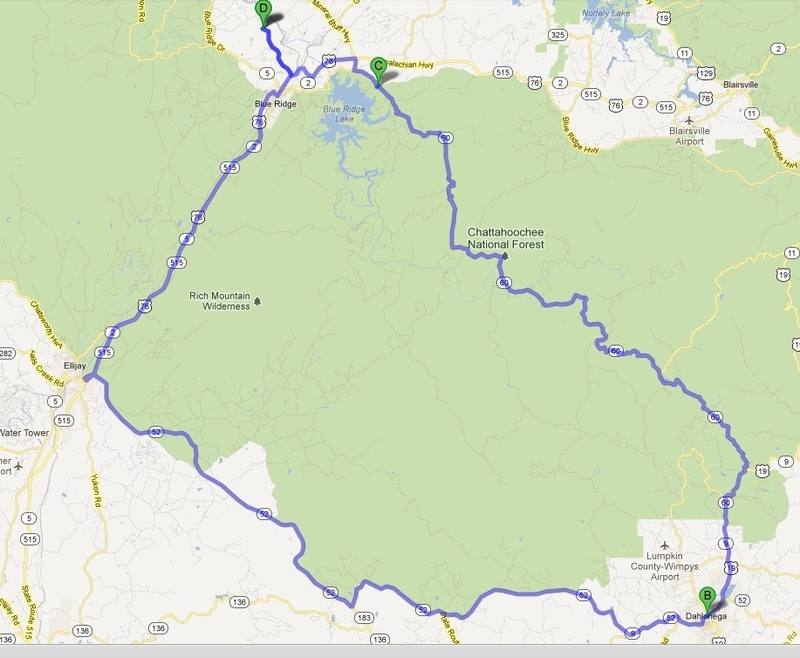 First half of the route was pretty easy – south on GA-515 to Ellijay then southeast on GA-52; about 60 miles total. Dahlonega was the site of the first major gold rush in 1828. Today the area is well known for its wine region, tourism and is the home of North Georgia College and State University. This college is one of six US Senior Military Colleges in the country. Established in 1833, the town square is home of the Historic Commercial District and is listed on the National Registry of Historic Places. We quickly found a parking spot on the square took a short stroll around to see what was here. 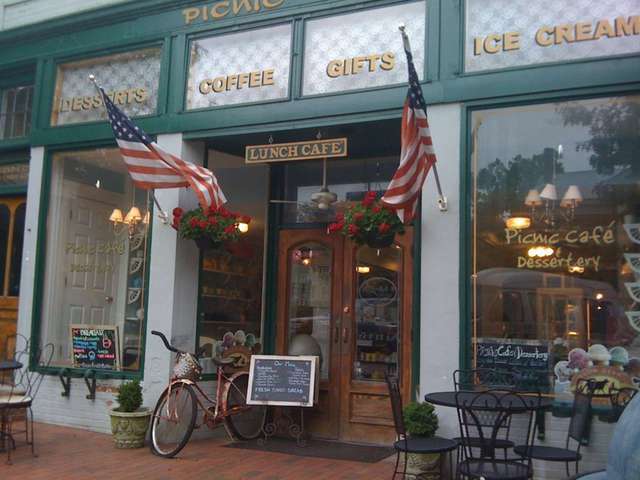 We decided to have lunch at the Picnic Cafe and Dessertery. Fresh homemade food was on the menu. I had a Pimento BLT while Carol enjoyed a Chicken Salad with Tomato Bisque Soup. All was yummy. And yes, we ate at a table on the sidewalk. After lunch, we took a second stroll around the square to do a little shopping. First stop was Gloria’s Added Touch. Carol found a new computer bag. We had a wonderful conversation with the proprietors Paul and Kirsten Chatani. Originally from Jamaica, he moved to Florida with his family, then later he and his family moved to Canada. They traveled around Canada with their 4 kids in a 14 foot travel trailer for 4 years. They then moved back to Florida but decided they did not like it there any more. So they moved to Dahlonega and open their store 6 years ago. Our conversation got started when Paul commented about Qianna. Yes, we took the dogs into the store. They encouraged us to travel as long as we can. Next stop was The Fudge Factory. It was time for a desert snack for the road. What can I say, we take time to stop for fudge especially when it is freshly made. Carol went in the store while I packed the doggies. So what did she get, Chocolate Covered Cherries and Chocolate/Peanut Butter Fudge. I decided the most direct route to Blue Ridge on GA-60 would be the quickest. We decided to stop at R Ranch in the Mountains. R Ranch is a private vacation ranch that has cabins, spacious RV sites, olympic size pool, state-of-the-art equestrian center plus more. Cool concept. Plus they are a Passport America RV Park. We could actually stay here when we travel through, if we can negotiate the steep switchback at the entrance. When we finally got back to Blue Ridge, and determined we may have taken the shortest route but we certainly did not take the quickest route. We will come back to the area because there are a couple of place we still want to visit. Some of you may remember the Cabbage Patch Kids dolls from the 1980‘s. Today the dolls can be found at Babyland General, in Cleveland just a few miles from Dahlonega. This will be our next trip down in this area. Plus there are a few more waterfalls near here I would like to see. We also found a Kangaroo Conservation Center, Dawsonville, GA This is the largest conservation center of Kangaroos outside of Australia. Unfortunately we discovered that they are no longer open to the public. That is too bad. Before I forget, we had dinner on Sunday evening welcoming Pam and Jerry back home from their vacation and saying see ya later to Julie who left Monday morning to go back home for a wedding in Pennsylvania. Carol and I provide a crock pot pork roast and fresh green beans, Tim and Karen provided scalloped potatoes and wine, Julie provided a yummy congealed orange salad. 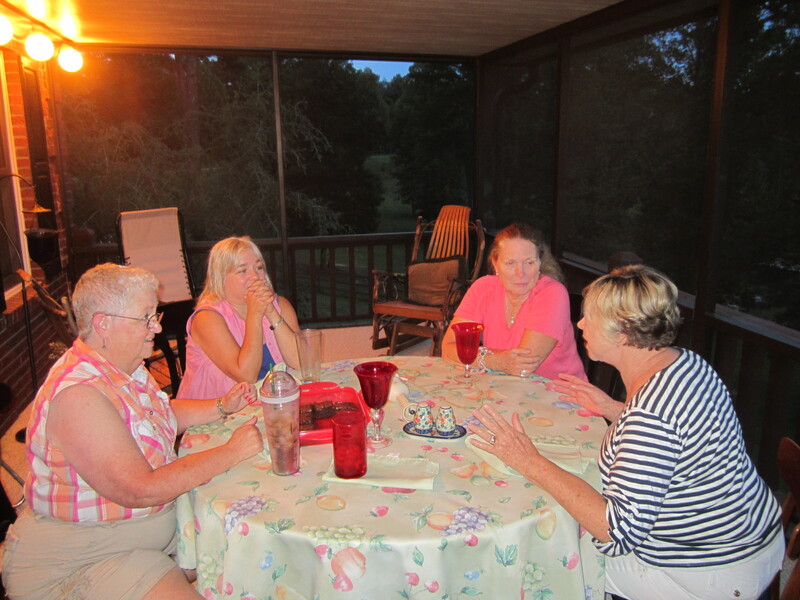 Left to right in the photo – Carol, Julie, Pam, Karen. Our weekend is over, and tomorrow is our Monday. Thanks for stopping by. Y’all come back now. NOTE: I am looking for a solution to give you, the reader, some control on font size of the blog posts. Please be patient as I search for a solution. Thanks and enjoy the reading. Hey, Pearson. What did you do today? Well, I took a quick trip to Chattanooga. Chattanooga?, Isn’t that in Tennessee? I thought you were in Georgia? Yep, Chattanooga, TN. Actually, Chattanooga is closer to us than Atlanta. Carol’s toy broke and we had to deliver it to an Authorized Dealer for repair. Chattanooga was the closest dealer. Roundtrip was 186 miles, plus there was a side benefit to the trip. Oh, yeah? What was that? We had lunch at La Altena, down on Main Street. It is just across the street from Pilgrim Pride’s chicken processing place. This is a hole in the wall, but the food was authentic. Of 255 reviewers, they rated 93% LIKE on Urban Spoon. That is a pretty good score for the number of reviewers. Carol’s Chicken Fajitas were moist and very tasty. My Camarones ala Mexicana where great. The plate had lots of shrimp, and loads of sautéed onions, tomatoes and jalapeños. Fresh chips were crisp. Salsa was very good. It was not a fancy place but certainly a place we will go back to when we are in Chattanooga. Cool, Pearson, what else did you do? Well, after that, we headed back home to Blue Ridge. We drove past Parksville Lake and Lake Ocoee on Highway 64. As we entered the Cherokee National Forrest, we noticed the middle section of the Ocoee River was congested with white water rafters. I have no photo of that because I cold not find a place to pull over. We decided to stop at the Ocoee Whitewater Center (OWC) to check out the Ocoee River, sans water. The TVA controls water releases from the three dams on the Ocoee. They release water in the upper section only on weekends. Since I wanted photos of the river around the OWC with no water running and with water running, I thought this would be a good opportunity to take photos of no water running. Here are a couple of those photos. This is a shot looking upstream towards the OWC. It is hard to imagine that this peaceful view will turn into a raging river on the weekend. And when we got home, this had arrived. That means I get to crawl back under our RV and replace our black tank valve. That should be fun. I can assure you I will back flush that tank a bunch before I pull the non working valve out. That’s it for day tripping. Y’all come back now.